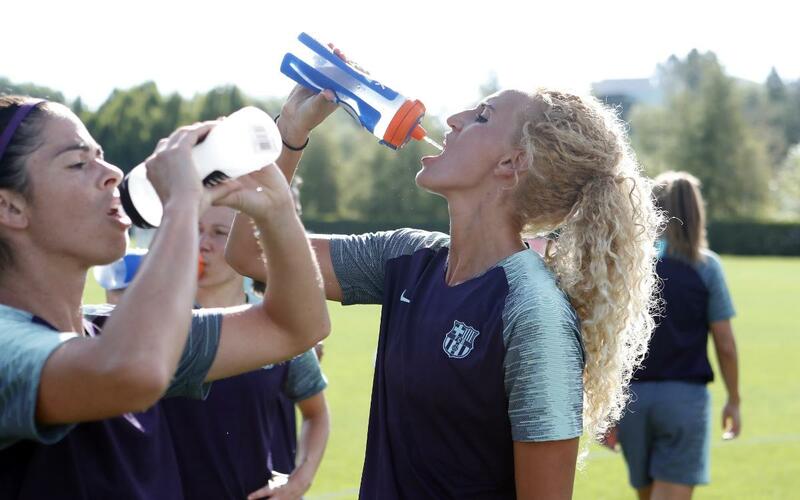 The FC Barcelona women's team barely had time to settle into their new surroundings at Beaverton, Oregon before they were getting straight down to work. Bright and early at 8.00am local time on Wednesday, they were out on the amazing Nike facilities for just the third training session of the season and the first outside of the familiar confines of the Ciutat Esportiva. They were joined by Mexican international keeper Pamela Tajonar, who has recently joined the club from Sevilla, and also by Brazilian Andressa Alves, who has met up with the rest of the team on her native side of the Atlantic. The 20 first team players are being joined by a further four from the reserves in a squad that reads as follows: Melanie Serrano, Vicky Losada, Gemma Gili, Marta Torrejón, Mariona Caldentey, Alexia Putellas, Sandra Paños, María León, Leila Ouahabi, Toni Duggan, Andressa Alves, Bárbara Latorre, Elise Bussaglia, Natasa Andonova, Lieke Martens, Pamela Tajonar, Andrea Pereira, Stefanie Van der Gragt, Kheira Hamraoui, Gemma Font, Carla Armengol, Aida Esteve, Paula Gutiérrez and Jana Fernández. “It’s very positive to be here. It’s a decision that once again shows how committed the club is to us. We’re thrilled to be here”. “Travelling with the men’s team and using the same facilities all goes to show how top level it all is. We’re excited. We’re so happy that the club got us to do this”.